Do freelancers need a special kind of bank? 1/ Since the financial crash of 2007/8 new banks have been encouraged to challenge the high street brands that got us into such a mess. 2/ The development of Open Banking is encouraging us to share our financial data with 3rd party apps, so that we can make wiser decisions about what we’re doing with our money. The upshot of this is that we have new banks targeting specific types of user, carving out a niche. This is very different from the old-fashioned impersonal monolithic high street brands. Monzo Bank has no physical presence beyond a lurid pink contactless debit card. It revels in its clever app, which buzzes in your pocket as soon as you use your contactless card to buy something. 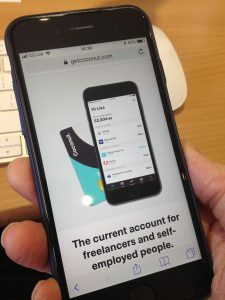 And now comes a bank which is targeting freelancers and self-employed people. Coconut Bank has spotted that freelancers have to do three money-related things all the time: earning money, spending money and tracking money. The tracking element is essential for self-employed people, as they need to report income and expenses to HMRC. So here we have a start-up that is aiming to combine traditional banking with small-business accountancy. Given that HMRC’s Making Tax Digital project is coming soon, this makes sense. Once we’re used to all our finances being digital perhaps we’ll be happy to combine the bank manager, accountant and financial advisor into one app on our smart phone. Whether the Coconut Bank succeeds in attracting large numbers of freelancers remains to be seen. Do let me know if you try it out. I’d love to hear whether it works for you. Either way, it’s an interesting time to be opening a bank account.